1. Tariff delays: President Donald Trump has approved another month of relief from steel and aluminum tariffs for key allies, including the European Union, Canada and Mexico. The White House said in a statement that it is finalizing an agreement with Argentina, Australia and Brazil concerning the tariffs and is “extending negotiations” with Canada, Mexico and the European Union. “The US decision prolongs market uncertainty, which is already affecting business decisions,” the European Commission said in a statement on Tuesday. 2. Apple earnings:Apple(AAPL) will report its first quarter results after the markets close. The company is expected to announce plans to return between $ 100 billion and $ 150 billion to shareholders, but even that may not be enough to calm investors’ worries about the iPhone. Apple stock fell this month after one of its key chip suppliers warned of “continued weak demand” for the key Apple product. Since then, a series of analysts have slashed their estimates for iPhone shipments. Apple’s overall sales are expected to increase 15% to about $ 61 billion. 3. AT&T trial concludes: The blockbuster AT&T antitrust trial ended Monday, but the decision on whether the company will be allowed to buy Time Warner is only expected to come in June. AT&T(T) and Time Warner(TWX), the owner of CNN, argued the deal is the only way to compete with the likes of Facebook(FB), Apple(AAPL), Netflix(NFLX) and Google(GOOGL). 4. 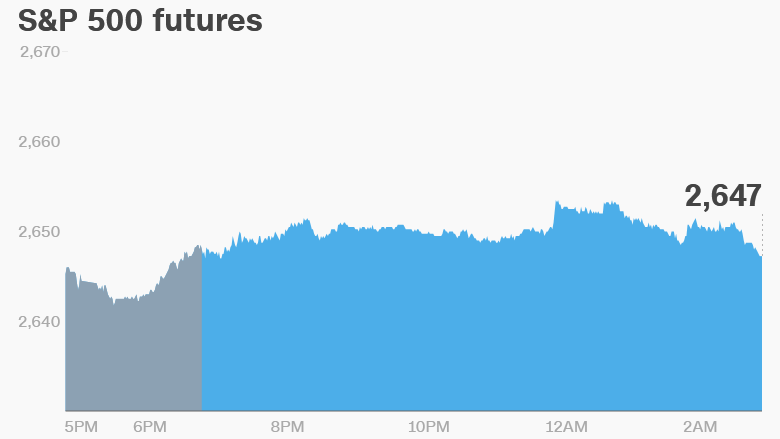 Fed meeting: The dollar, measured against a basket of major currencies, was trading at its highest level since early January ahead of the start of the Federal Reserve’s two-day meeting. The US central bank raised interest rates by a quarter of a percentage point in March. Economists have penciled in three gradual interest rate hikes this year, but the Fed has signaled in March the path of future rate hikes could be “slightly steeper” over the next few years than previously thought. 5. Global market overview:US stock futures were flat. Many of the world’s major stock markets were closed on Tuesday. London’s FTSE 100 edged higher. In Asia, the Nikkei posted a small gain. The Dow Jones industrial average closed 0.6% higher on Monday. The S&P 500 and the Nasdaq both shed 0.8%. 6. Companies and economics:Aetna(AET), Ecolab(ECL), GrubHub(GRUB), HanesBrands(HBI), Merck(MRK), Pfizer(PFE), and US Cellular(USM) will release earnings before the open. Allstate(ALL), Denny’s(DENN), Gilead Sciences(GILD), Mondelez International(MDLZ), Snap(SNAP), T-Mobile US(TMUS), Voya Financial(VOYA), and Yum China(YUMC) will follow after the close. Shares in BP(BP) opened around 1% higher after it reported strong results. The oil company was helped by higher oil prices and slew of new projects. Boeing(BA) has announced a deal to buy aerospace parts distributor KLX Inc(KLXI) for $ 4.25 billion. The manufacturer said the acquisition will help it save around $ 70 million a year by 2021. The Institute for Supply Management will publish its US Manufacturing Index at 10:00 a.m. ET. Australia’s central bank left interest rates unchanged, signaling that a near-term rate hike is unlikely. Canada’s GDP data for February will be published at 8:30 a.m.